The long Memorial Day weekend marks our annual spring fishing trip, to the classic salmon habitat of West Grand Lake. A full month before the weekend, the planning begins in earnest, as family and friends make the fishing gear transition from ice fishing to trolling. Ice shacks hauled off shaky ice, become reverted temporarily back to garden sheds. Trolling rods, yanked from garage rafters, undergo thorough inspections and reels containing last season’s lines are stripped off and new installed. Flies and lures, beaten from last season’s angling battles, are checked for bend shafts, missing barbs and have their hooks re-sharpened. Though perhaps a tad bit excessive in preparation, it puts me more at ease absolutely knowing the strength and quality of my fishing line, gear and tackle, rather than relying on pure faith, when battling a wall worthy salmon or lake trout (togue). Late May, brings with it hordes of hungry salmon and togue, intoxicated by newly available forage and driven wildly by hunger, after the desolate winter season. Despite their wanton desires to fill their empty bellies and replace depleted fat reserves, this does not mean, however, that the fish are always biting and hungry. Last season, our first day of fishing was marked by incredible action, spurred by a titanic eruption of Hendrickson mayflies that whipped the salmon into a feeding frenzy. In a day of trolling the lake from sunrise to sunset, from the Grand Lake Stream Village landing to Hardwood Island and concluding at the mouth of Whitney Cove, we succeeded in bringing 20 salmon to the boat. Most fish were between 15-17 inches and included one well-fed football shaped monster that succeeded in registering 18 inches. Our second day was considerably more difficult and the salmon needed A LOT of “convincing” to elicit strikes. Through trial and error, we managed to get several average salmon into the boat, finally hitting gold with any lure containing the color “pink”. The remainder of the weekend was marked by high winds, cold temperatures and our last half-day of fishing, yielded not a single strike. As in all angling adventures, there are highs and lows, times when the fish bite and times when the “strikes” go cold. Show me a map of West Grand Lake and it would be difficult for me to indicate a specific spot where I have fished and not caught many fine salmon and togue including; Whitney Cove, the Throughfare, around Hardwood Island, Oxbrook, Pineo Point and many other locations. I am confident that when the fish are biting, anyone with a basic sense of direction and a good depth map will find success. West Grand Lake should not be trifled with any time of year but especially during the early season. Those wishing to fish its watery depths need to have a backup plan should weather turn dangerously nasty. The ice may have long since receded but unfriendly winds can still nip flesh and past trips have run the totality of extremes from arctic conditions, to sunny blue bird days spent lounging around in shorts and t-shirts. As the saying goes, this is typical of Maine weather and it is better to simply be prepared than second-guess what Mother Nature might decide to offer up. Look for West Grand Lake on DeLorme’s The Maine Atlas and Gazetteer (MAG), Map 35, B-3, B-4. 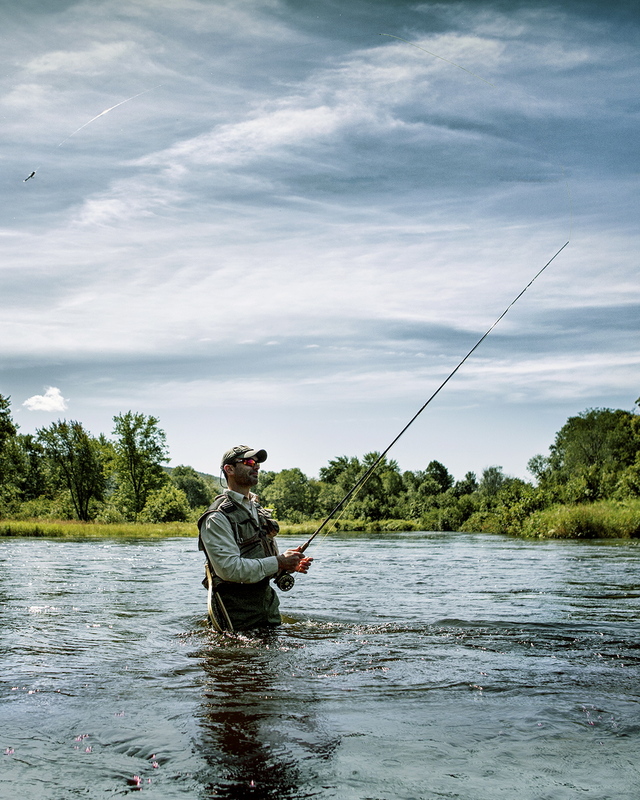 A predictable alternative, when the weather turns wild on West Grand Lake, is fly-fishing Grand Lake Stream. The area below the dam on the West Grand Lake end of the stream is popular and can get crowded. Don’t be disappointed, most people freely offer advice on what flies are working and will help point you to fish. For a more tranquil experience, don’t be afraid to leave this area and thoroughly explore the stream, finding your own secret spots. May fly and caddis patterns are good choices or for more specific advice, fly- fish with the suggested flies, from the local town store/fishing shop. Use caution when wading the stream and be sure to bring a full arsenal of bug spray. Typical of May the stream is typically so thick with blackflies that opening your mouth will result in collecting enough to make a fairly healthy sized appetizer. If you are short on time and/or experience, the area lodges will happily assist you in finding a registered Maine guide to lead you around the stream and take you to the best pools. Look for Grand Lake Stream on DeLorme’s The Maine Atlas and Gazetteer (MAG), Map 35, B-4. By the end of May, turkey hunting has typically digressed to the point of sheer desperation. The gobbling has all but shut down, the black flies are miserable and with each labored footfall, the noon day sun makes sweat oozes from every pore. A month of hard hunting, has taken its toll on body as well as spirit and early mornings now necessitate much coffee to fuel bodies beyond the front door. The barely containable excitement, felt in the first few weeks, has now faded and hunters begin to accept that they may end up birdless. I encourage you to continue to be vigilant and not succumb. Instead refocus your attentions and hold out for those last few days. Late season turkeys require you to add a few different tactics to your normal turkey hunting tool kit. This includes calling less if at all and leaving the decoys at home. Examine the ground carefully for fresh tracks and scratchings, indicating recent travel activity. Find these often used woods roads and trails that frequently force turkeys into narrow connecting points between roosting and feeding areas. Incorporate deer hunting tactics, and sit at these ambush locations. Use a blind, have a seat, good bug spray or a Thermacell and prepare yourself for a long sit. With the right amount of patience and perseverance, that late season gobbler will be yours! Good Luck!